For 2 out of the 3 trees it was very simple to plant the tree as the soil was very good and to this day both are living very well and growing very well. The third one I planted was very difficult to plant; not only was there a LOT of clay but there was a TON of poured cement / crushed concrete. It appears (since this was a newly built house) that the builder just dumped either crushed concrete or concrete itself in this one area and covered it up with some dirt / clay / soil. I tried as best I could to dig a hole and was so tired in doing so I finally got enough dug to place the tree in the hole. This tree was always much weaker then the other two trees and eventually this year died. So because of the design of these three trees this is the first one in a row that has died. So just taking it out and growing grass would look really odd as I am missing the first out of three trees. So I have to replant one...so I dug this one out and have been using a huge pick to pick as much concrete out of this hole but it appears I am surronded by this crushed concrete. I guess my question is how far deep or along the sides do I need to keep digging in order to plant this tree correctly? I do not want to end up with the same mistake the first time of my tree dying again. Is there some sort of limit in depth or width I need to go before I can say stop then plant the tree and surround it with good dirt? With this in mind besides top soil should I add some peat moss / wood chips to enrich the health and promote growth on this tree? That tree isn't going to be able to break through the concrete itself. 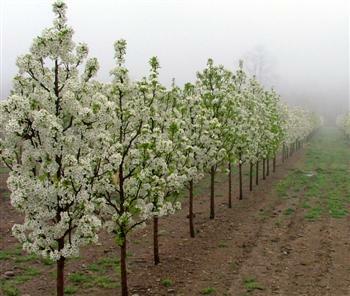 (Maybe some trees can, but your flowering pear's probably not going to thrive.) So I'd say you need to at least give it enough room to get into some real soil. You also want to make sure it has good drainage. It sounds like what you may have had before was a concrete bowl? It's possible you were drowning the roots a bit every time it rained. Keep in mind that (roughly speaking) the tree's roots are like a mirror image of the branches. So you want to know that it can spread its roots approximately how the branches are going to form. It sounds like the spot where you're trying to plant is where the concrete trucks washed out after pouring your foundation. Depending on how big your foundation is, it's possible that you've got a bit to dig through. You may also encounter other construction debris -- I've heard of builders dumping/burying some of their scrap onsite to avoid having to haul it away and pay the landfill fee. I ended up digging about 2 1/2 ft deep and 2 1/2 ft around (width wise). Filled it with very good top soil, a little organic matter (cow manure), and a little peat moss. The mix looked really good (from a landscaping perspective :) ). After this I went to the local Joe Randazoo nursery and purchased a flowering pear tree, fairly large for only 29 bucks. I placed it on top of the good soil and then covered it with more good soil mixture and fertilized it and added a tree spike to it. It looks great. The tree is still growing strong...I think it worked out for me. Check the pH of the soil. Concrete can add too much lime and make the soil too alkaline for your tree. Tree roots are primarily the top 6" of soil so depth isn't a problem unless the concrete is stopping drainage. I don't advocate peat moss but the use of peat moss probably brought the pH down to a level the tree needed. Try to never plant plants in a straight line. Staggering helps tremendously. This also gives them more room to grow while providing the look you want (fence). Those pears in your picture are too close! Ok for a nursery but if they had been staggered (triangle formation) they'd be healthier and you wouldn't notice if one or two died. Not the answer you're looking for? Browse other questions tagged fruit-trees trees soil-amendment pear or ask your own question. May have planted my tree wrong… is it too late to dig it up and replant it? What to do with a this tree which has become too big for its current position?